Epistory immerses you in an atmospheric action/adventure game where you play a girl riding a giant fox who fights an insectile corruption from an origami world. As you progress and explore this world, the story literally unfolds and the mysteries revealed. Epistory won several awards for its innovative mechanics, gorgeous 3D art style and soundtrack. It also got an honorable mention for its visual art at the prestigious IGF 2016. 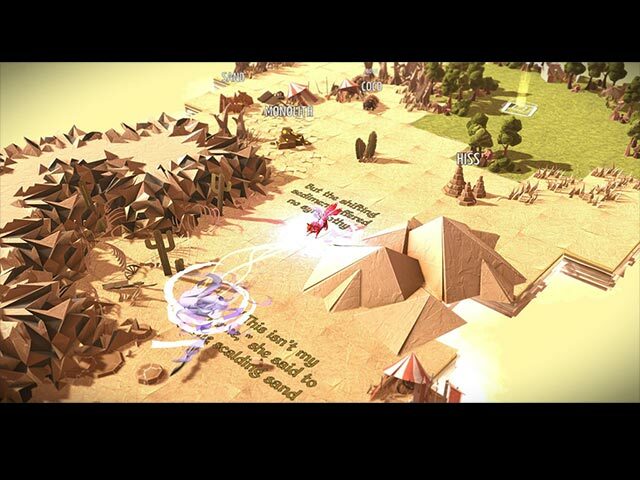 To get the most out of Epistory, play with the graphics on "fantastic" mode. The best typing game you will ever play! Collect inspiration to unfold the story! 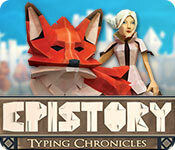 Epistory: Typing Chronicles is rated 4.4 out of 5 by 58. 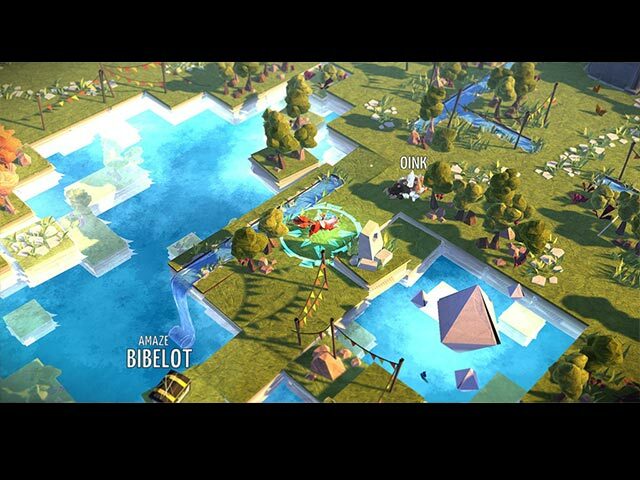 Rated 5 out of 5 by meme2222 from Stil one of the best games around and doesn't get old This game has everything for the person who likes typing, mazes, and discovering using their brain to try to figure out what is next? It will unwind a delightful poetic story as you ride your fox through different landscapes. Knowing how to type, at least a bit, is a must. NO one finger typists. You can put on easy mode so challenge does not advance as you progress which makes it more of a fun adventure. Also upgrading KNOCKBACK bonus as quickly as possible makes it doable for a slow typist. This game not only helps improve your typing but has fun vocabulary words as well. 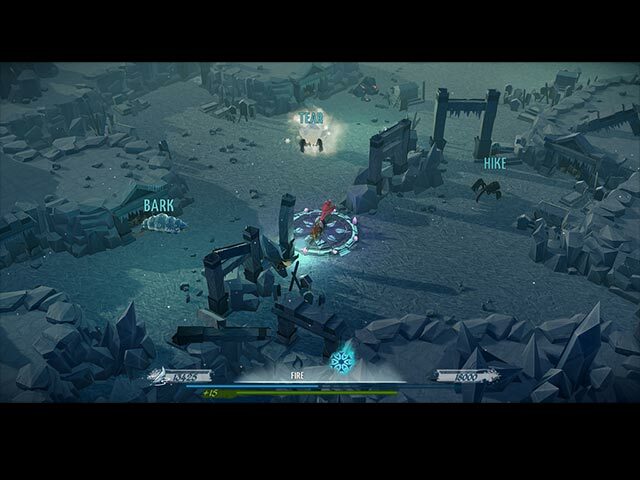 The gist of the gameplay is to spell words to break down impassable barriers and other landmarks while trying to navigate to key points that will progress the story. You'll have to find the openings using your spacebar if you come across areas you can't access. That's the maze part. To improve your typing skills some areas are blocked until you obtain enough points by typing. You will come against battles where bugs come at you SLOWLY with words you must spell to kill them before they reach you. Sometimes you can RUN if not in the level arena, so you can approach them from a different angle that might give you extra time to type . Does not matter if you don't succeed because it will restart at place you failed. So don't fret if you are not up to par with your skills. The main thing is it will help you improve your skill by redoing without having to restart. It says, oh that didn't go well, lets try again. I love that feature, so it is no pressure and enjoyable. If you are great in typing it still can be a challenge if you put on the harder mode that will make you type faster as you progress. Check the box in the options menu. It also gives you a map with a legend that lets you know all the key points you need to find. You will go back and forth in the realms as more of the map is uncovered. Get enough typing points indicated by this blue bar that denotes your score until you can activate a reveal spot to open more of the territory. I found it difficult to ride the fox with the keyboard (kept forgetting which keys to use ) so I just used my arrow keys. I had enough time to replace my one hand to the qwerty keyboard to begin spelling but you should try both to see which is more comfortable. The puzzles are not very difficult but you will have to ponder to figure it out since there is no explanation. FYI, gibberish words means you cannot access that part of the map yet. I spent too long trying to get past an area before I figured that out. Access the map if you ever get stuck and don't know where to go, it will help. When you progress in the chapters you will get fire and ice that you must spell before banishing the different words depending if they are red or blue. Very fun advancement. Personally I just love the way the land unfolds and having to recognize barriers so you can get those extra typing points. Rated 5 out of 5 by karatop from Clever with a capital "c" This game is so unique! You fight creepy crawly bugs and flying critters to reach each "zone," but you do it by spelling the words the bug creates. It sounds much more juvenile than it is. I'm a gen-xer and I love this game. You definitely can't be a hunt and peck typist because the words come at you fast. I've probably played it a dozen times by now, and as a very fast and accurate typist I still can't get through the game without dying. Thankfully, you have an infinite number of lives. Just wait until you encounter the Bug Boss of all bug bosses!. I really wish the developers would consider an Epistory 2. Rated 5 out of 5 by Epic_Maus from In a sea of conformity, finally a truly unique title This game is visually beautiful and unique, has an interesting game mechanic for expanding the world, and has an intriguing story - a rare thing indeed on Big Fish. Don't get me wrong, I enjoy playing half a day's worth of a formulaic match three or HO game. But games that actually inspire me to write a review are few and far between. Parts of this game are challenging (e.g. some of the puzzles), and took me some time to figure out, but there's nothing that brought me to a full stop. I'd love to see more games like this on Big Fish, and I hope the number of high ratings for this game will equate to that. Rated 5 out of 5 by BFGamesFan from My favorite computer game This is absolutely my all-time favorite computer game. It's beautifully illustrated and the storyline and challenges are uniquely quirky! I love the different worlds and trying to find all the hidden secrets. Fortunately, I'm a really good typist, so the Arena challenges are right up my alley. Bravo, Fishing Cactus. Please make more games for the Mac! Rated 5 out of 5 by melmill2552 from Fabulous 'Different' Game! This is one of those games when it is extremely rewarding to perservere with the different format. This review is based on game completion. As the title says, it requires that you be a good typist to get through it successfully. You need also to pay attention to any instructions - there aren't many, but they're vital to know. Using the TAB key to view the Map and other necessities. You will often need the MAP, as the world literally builds around you. The whole game is a joy to play. Rated 5 out of 5 by botanybob from Very Unique Game This game probably isn't for everybody, but I found it captivating. The original graphics and storyline really draw you in. What I enjoyed was the challenge of trying to figure out what the rules and objectives are. You find yourself in this very unusual land at the start and you need to figure out how to explore this world and uncover its mysteries. You encounter puzzles along the way that become increasingly difficult. Again, you are not told what the puzzle is exactly, you just find it and need to figure out what action will work. This is really the best game I have found on Big Fish. Rated 5 out of 5 by AdrianaIP from Please more games like this!!! So new, so innovative. I do not recall having so much fun with a game. The setting unfolds slowly, and you get to find out how it works, on its own. It may be irritating at first, but once you figure it out you feel so much smarter. I would like to find the written version of the narration, as I think it is a superb story. Now, if instead of so many cookie cutter HOG and Adventure games we could have games like this I'd be elated. Rated 5 out of 5 by woodlandelf from Outstanding game! This was the most amazing game I have ever played! It's creative, imaginative, a little bit challenging but not too much so. I loved how the game literally unfolded like origami and it's fun to play. It's fun to type words to kill the insects. It's quite a long game. I just finished it and now I want more! I guess I'll do it again soon. Highly recommended! Rated 5 out of 5 by Caith from Beautiful and different After playing the demo I umm'd and arr'd about buying this game, but I'm so pleased I did. Visually, it's stunning. The paper pieces unfold into landscapes and I was constantly wowed by what came next. The basic premise to advance is to type words of varying difficulty, correctly, at speed. If you don't like typing this might not be for you. But I honestly think my touch typing skills improved through playing this game! My only negative would be that the words are American spellings and as a British person sometimes I was typing a word how I'd spell it so got killed a couple of times because of it. But it's really not a big issue. The screenshots don't do the game justice. Download the demo and give it a try. It's a game that is genuinely different from the norm, really enjoyable and beautifully put together.